A view of a vehicle operated by the Royal Household has appeared in these columns already, in the form of PYY 28D, but YT 3738 appears to be a different animal altogether, being noted as bought new by King George V himself. A Leyland Lioness PLC1, with Leyland body, it dates from 1927. Originally a van, it was rebuilt by Thurgood in 1938, to the C26F layout we now see. It carried the Jersey registration J 8462 for a while. 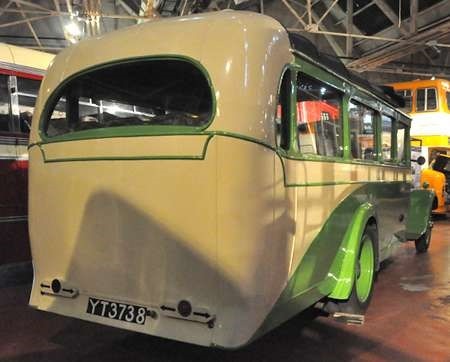 She has been resident in the museum at Leyland for a number of years, and we see it there on 19 August 2012. Was it, perhaps, a luggage van when new, and then converted for staff transport or for guests on hunting parties? The Leyland Lioness name embraces two distinct models. The PLC1 was a normal control version of the PLSC Lion of 1925, designed by J. G. Parry Thomas before he was lured away to the world of motor racing. The PLC1 (the ‘S’ for side driving position was naturally omitted) had the same 5.1 litre four cylinder ohv engine and four speed crash gearbox to meet the still significant demand for a bonneted bus and coach chassis. 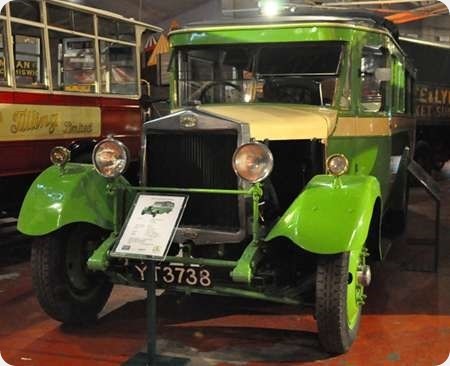 In 1926 G. J. Rackham became Chief Engineer of Leyland, the fruits of his thinking emerging in 1927 as the six cylinder Titan and Tiger designs. The Lion name continued for the updated LT four cylinder single deck range. A bonneted version of the Tiger was offered as the Tigress for a short time, but, around 1929 this model was discontinued in favour of a more powerful version of the Lioness, the LTB1 (‘B’ for bonnet – the ‘P’ for pneumatic was by then redundant) which employed the six cylinder 6.8 litre engine and other components of the Titan/Tiger, including its four speed crash gearbox. Peter Stanier’s DM 6228 is a well known example of this later type. I believe that YT 3738 was originally bodied as a shooting brake for the Royal Household of King George V rather than a van, and served for some 10 years before being sold off to Jersey for psv duties.